Speedball is the only manufacturer able to offer all the materials needed to create your drawing or lettering project all in one place. Whether you’re just starting out on your lettering journey or a seasoned scribe looking to experiment with new tools, Speedball’s unequalled range of drawing and lettering kits and sets combines superior quality, convenience and value. 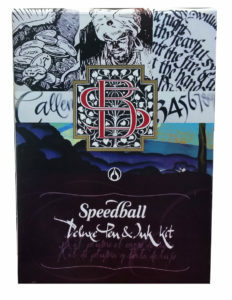 The only all-in-one calligraphy kit on the market, the Speedball Complete Calligraphy Kit allows artists of all skill levels to experiment with a diverse range of drawing & lettering tools. Featuring all that’s needed to begin creating stunning lettering and provided at a value price, this kit includes: (1) Bienfang® Calligraphy Practice Pad, (1) Standard Penholder, (1) Oblique Penholder, (1) C-Series nib (C-2), (1) pointed pen nib (#101), (1) 12ml jar of Super Pigmented Acrylic Ink, (1) 12ml jar of Pen Cleaner, (1) Elegant Writer® marker (1.3mm, Black). In addition, you’ll find the superlative resource in lettering for over a century, The Speedball Textbook®. A celebration of our proud tradition of fine pen-making, the Speedball Collector’s Set is an ideal addition to any lettering artist’s collection. Featuring an array of our most popular pen holders, nibs and pigmented acrylic inks, this set provides artists the ability to create beautiful works with superior tools. The Speedball Collector’s Set is housed in a premium wooden box and features: (1) Standard Penholder, (1) Oblique Penholder, (1) Crowquill Penholder, (1) Black & Gold Classic Penholder, (4) broad edge nibs (A-5, B-6, C-2, C-3), (4) pointed pen nibs (#101, #102, #512, #513EF), (3) 12ml jars of Super Pigmented Acrylic Inks (Black, Red, Blue), (1) 12ml jar of Pen Cleaner. 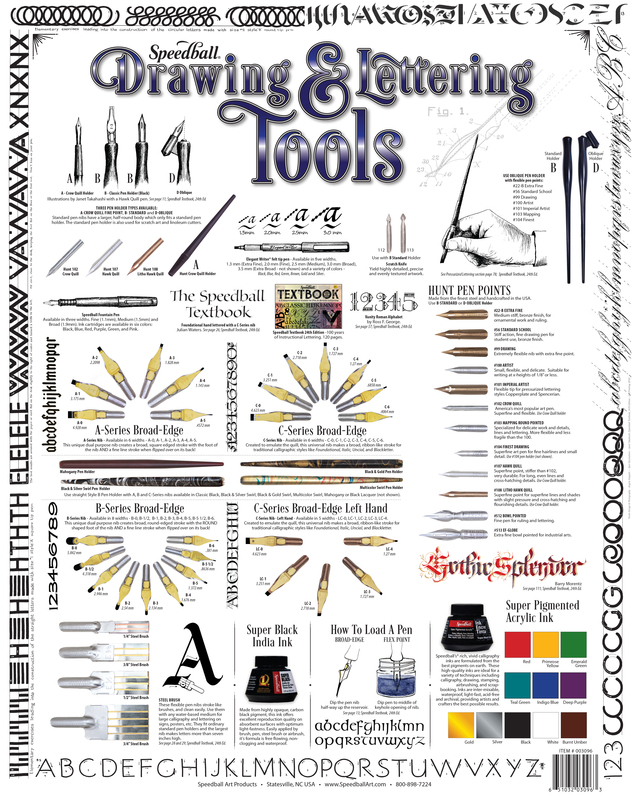 Also features the favorite resource of all lettering artists, The Speedball Textbook®. Designed for pen and ink artists, letterers and calligraphers, this kit includes the following: (3) 12ml jar of Super Pigmented Acrylic Inks (Scarlet Red, Indigo Blue, Gold) and (1) 12ml jar of Pen Cleaner, (4) broad edge nibs (A-5, B-4, C-1, C-2), (1) #102 Crowquill nib, (1) #107 Hawk Quill nib, (1) Standard Penholder, (1) Crowquill Penholder, (1) Speedball Textbook, practice paper, (1) five-well palette; (1) eye dropper and (1) brush. This introductory kit is ideal for the beginner and contains (1) 2oz. jar of Super Black India Ink, (1) Standard Penholder and (3) C-Series pen nibs (C-1, C-2, C-3). 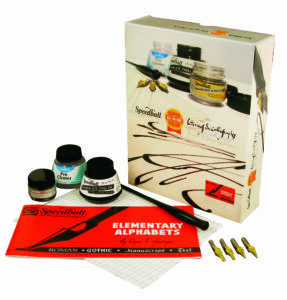 This kit has an assortment of the essentials needed to get started in drawing or lettering and includes (1)ea. of the following: 2oz. jar of Super Black India Ink, 2oz. jar of Pen Cleaner, 12ml jar of Super Pigmented Acrylic Ink (Silver), Standard Penholder, and the Elementary Alphabets book. Also features (4) broad edge nibs (A-5, B-4, C-1, C-2) and calligraphy practice paper. If you're new to calligraphy, our introductions to Speedball's Complete Calligraphy Kit and Calligraphy Collector's Set are great ways to get an introduction on how to get started on your creative journey!